Yesterday we had our very first garage sale. I’m not talking about the first of the Summer or the first of the year; I’m talking about the first ever. I’d never held a garage sale before and the sheer amount of clutter that was strewn about our yard was evidence of that. We were garage sale noobs and at the end of the day it really showed. But despite everything, we did make some sales and most importantly we got rid of more clutter. We also learned some important lessons along the way. 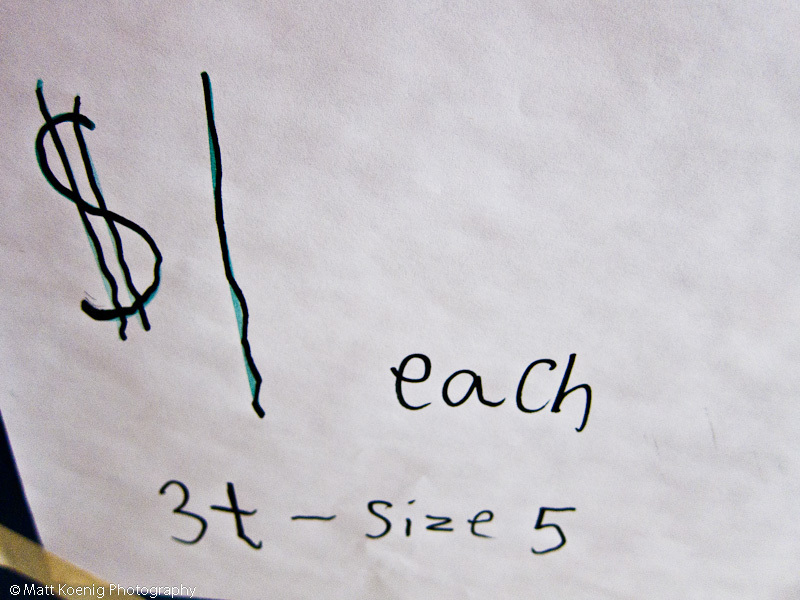 Here are 5 lessons we learned from our first garage sale. Have cash on hand to make change – the first guy that bought something paid with a $20 bill. While I was thankfully able to make change for him it wiped me out for the rest of the day. I suggest having at least $40 in singles so you can easily make change for people who don’t have the exact amount. It’s easy to think that people will show up with the exact amount of cash in hand. The problem is they typically don’t. Price high, negotiate low – I think we sold a lot of our items for less than we could have gotten for them and I say that because of the gleeful look in buyer’s faces when they saw the prices on some of our items. Granted, the main goal of our garage sale was to get rid of clutter but we also wanted to make a few bucks for our travels and not give the stuff away either. It’s easier to negotiate prices down than negotiate prices up. People show up at a garage sale looking to negotiate so give yourself some wiggle room so you can play the game. Don’t schedule a conflict – We didn’t realize that we scheduled our garage sale the same weekend as the Eugene Celebration. I’m guessing that a lot of people that would typically garage sale were down at the beer garden enjoying the celebration. We saw pretty meager traffic until after the morning parade ended. I’m thinking we would have done better on any other weekend. Also, be prepared for the early bird. We advertised our sale starting at 7AM but we still had people show up well before then. People smell blood and they want to get the early deal. Nothing you can do about that but prepare for it and hope they buy it all early so you can enjoy the rest of your day. Have tough skin – That fancy vase your now long departed grandmother gave you doesn’t have the same sentimental value to the person looking to get something for nothing. You have to keep those emotions in check and realize that your ultimate goal is to get rid of the clutter and make a few bucks in the process. The first guy that showed up at our sale offered me $7.50 on an item priced at $30. At first I was offended but then I realized that this was the game; the allure of garage-saleing. I try and maximize profit and he tries to minimize cash outlay. This is why I believe lesson #2 above is an important one. We ended up making a deal in the end and we both parted ways happy. Don’t let your kids into the negotiations – I was selling a swimming pool with lots of extras. I had a guy interested and one of the first questions he asked me was whether it had a leak. I assured him that the pool hadn’t leaked when we took it down a year ago. He agreed to my price and paid me. Just as we were getting ready to load it in his car my son comes up and says “Is that the pool with the leak in it?” I then had to quickly explain to my son (but mostly for the benefit of the buyer) that he was obviously confused with another pool that we had that did develop a leak that I ended up patching. It didn’t work and he continued with his emphatic insistence that this was the pool with the leak. So now I’m in an awkward situation of my son blabbering on and on about some non-existent leak and a guy who just handed over his money to me with a big question mark on his face. I felt trapped in an episode of “Kids say the darndest things”. But he ended up taking the pool and made a comment about my son “throwing me under the bus”. So how did we do on our very first garage sale? We ended up selling over 40 individual items and bringing in $125. Could we have made more money with better advertising and more aggressive pricing? Probably, but the big win of the day is that we are now 40 items lighter and to me less clutter means we’re one step closer to realizing our sabbatical goal. We plan on having one more garage sale before we depart despite not really feeling that it’s worth the effort. It takes a lot to price everything, move it out into the yard, sit around negotiating with people and then move everything that didn’t sell back into the house. I think when one takes into account the time involved that Craig’s List and eBay are better more efficient avenues of selling. Have you ever put on a garage sale? What have your experiences been? What tips can you offer to the garage sale rookie? Nice to “see” you again. Hey Susana! We certainly learned a lot from this one. We intend to have one more before we depart but I’m going to be putting a lot of stuff up on Craigs List and eBay as I think the time/effort ROI is better. Garage sales are a lot of work and they take up most of the day. Overall I’m happy that we got rid of a lot of clutter and made some money but we still have much further to go. And yes, it is amazing how much clutter we can gather. While I struggle with the emotional attachment to some items I overall feel good about letting them go because I know it’s just another step toward realizing our dreams. Cheers! What a great story! A nice way to sum up your garage sale. Too funny about your son getting in on the action. Had he heard the fellow asking about the leak? Or was it just an unfortunate coincidence that he bought that up and threw daddy ‘under the bus’? Good advice too. I’ve never had a garage sale, but will keep that in mind if I do. Hey Tristan! I could have strangled him when he wouldn’t shut up about the leak. I thought for sure the guy was going to ask for his money back. Just yesterday I took a giant load to the dump. More clutter gone for good. We’re getting there! Congrats on your first Garage sale. My wife and I go to Garage and yard sales every weekend looking for a deal. There are some real pros out there when it comes to negotiating a deal. LOL on your son putting in his 2 cents when you were selling the pool. I have been to several yard sales where kids were selling lemonade and cookies to shoppers. Hey Justin! A friend told me that the early birds are the pros that typically have used items stores and are looking to get bottom dollar deals so they can turn a profit. Definitely some personalities that showed up. Lots of people asking about gold and other jewelry and a few people looking for guns. People even negotiated on $1 items. The neighbor kids were selling lemonade (although I think my kids were his biggest customer) and my kids were selling donuts or giving them away for free with the purchase of any item. My oldest son definitely needs to work on his sales technique and stop talking about leaks. LOL!! Buying guns at garage sales?? Omg, that’s scary (guess my Canadian-ness shows). I did try the garage sale thing once but didn’t make much $. When we moved house, we ended up putting a lot of big stuff (furniture etc.) at the end of our drive with a ‘free’ sign and most went pretty fast. We also do freecycle.org…that helps keep reusable stuff out of landfills, or we donate to second-hand charity stores. I’m constantly trying to declutter so we make a lot of runs to those places! Haha!! Yeah, this is the wild west. Everyone is looking for guns. I didn’t really want to sell mine to someone I didn’t know so I sold them to a friend. We’ll be taking quite a bit of stuff to Goodwill which not only helps keep stuff out of the landfill but also creates jobs. Our biggest failure was that we didn’t declutter on a regular basis. I don’t think we will have any problems getting rid of furniture. There seems to be a huge market here for used furniture. That story about your son is priceless. You know, if the pool does leak, he’ll know where to come to get his money back!